When a person has constant muscle spasms, pain or muscle weakness somewhere along their body due to an injury, not treating the issue as soon as possible can lead to future problems. A treatment table such as the Armedica AM-300 Treatment Table will help physical therapists be more prepared to help their patients recover by offering features such as a raised center and a contoured face opening. The AM-300 can be used by individual physical therapists or physical therapy centers for helping relieve the aches and pains of their patients. The three-piece top section has an opening in the head area for patients. This breathing slot is ideal for a person laying face-down on the table. The head section is adjustable too. You can raise it 45 degrees and lower it 90 degrees. The midsection raises too, up to 30 degrees, and it even has a spring-loaded lock. This feature helps Chiropractors get the proper position needed to help alleviate some pain for their patients. The center section may also work to relieve back pain to patients that have a difficult time getting comfortable lying on their backs. Lastly, the foot section rises up to 73 degrees. 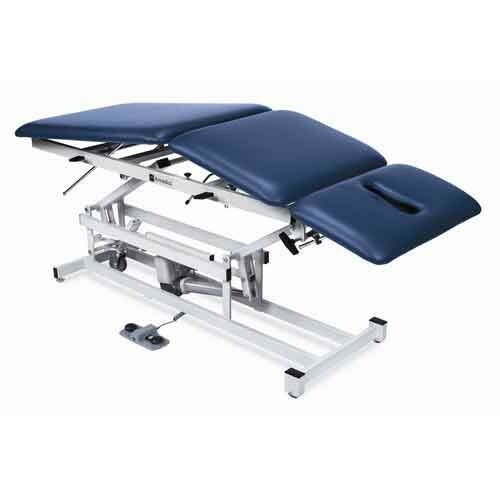 The AM-Series Treatment Table gives professionals a fully-adjustable table. The ability to adjust to any setting offers maximum results for the patient with minimum effort required by the professional.